Directed by Jerry Schatzberg and written by Garry Michael White, Scarecrow is the story of an ex-convict who teams up with a former sailor on a road trip to start a partnership. The film is an unconventional road movie that pairs two very different men who bond during a road trip as they each look to find something for themselves. Starring Gene Hackman, Al Pacino, Eileen Brennan, and Richard Lynch. Scarecrow is an offbeat yet engaging film from Jerry Schatzberg. The film revolves around two very different men who are both going east as they team up to form a partnership where they deal with their different personalities and desires in life. It’s a film that doesn’t play by the conventions of a road movie since the two leads in this temperamental ex-convict and an energetic ex-sailor who don’t know each other as they meet on a road as they’re both trying to go east. Along the way, the two go into a series of misadventures and stops in a few cities where they both deal with their disparate personalities and goals. For the temperamental Max (Gene Hackman), he is eager to start a car wash business as he had been planning for years. For the former sailor Francis (Al Pacino), he hopes to go to Detroit to meet the child he had just discovered as he joins Max on the journey while hoping to work with him washing cars. Garry Michael White’s screenplay doesn’t just play into the different personalities of Max and Francis but also these two guys who are likely to be the last group of guys that should work together. Yet, they come together due to the fact that they have no one else to work with as Max is a man who likes to plan things and needs to go to Pittsburgh to get the money that he needs. For Francis, Max is someone he can latch on to as he is someone that needs an older brother figure while Max realizes he needs Francis to control his temper as he often gets into fights which is why he went to prison for six years. Francis has spent a lot of years in sea as he is often carrying a box where it’s a gift to the child he has never known as he hopes to meet the kid and do the right thing. Though there’s moments where the friendship is tested, the two realize how much they mean to each other as they hope to reach the dream of doing something good for themselves. Jerry Schatzberg’s direction is quite simple as it plays into two guys going on the road from the American west to the east as it’s an offbeat road film where two guys travel by being passengers in other cars or ride trains from city to city. It’s a film where Schatzberg does use a lot of wide shots for some of the film’s locations that is set in places like Detroit and Denver while maintaining something that is intimate with its usage of close-ups and medium shots. The film also has a looseness as it relates to the humor where there’s a scene of Max talking to a woman while Francis is trying to carry a door as he would slip. Schatzberg would also maintain some tension as it relates to the second act where Max and Francis are in prison where the latter befriends a fellow convict where things eventually go very wrong. Yet, it plays not just into the development of the two men as individuals but also as friends where they do whatever it takes to help each other. Even when they’re both directionless while yearning to reach the dream for a better future for themselves. Overall, Schatzberg creates a very witty yet enchanting film road film about two different men going on a journey to find a better life. Cinematographer Vilmos Zsigmond does amazing work with the film‘s cinematography as it is filled with gorgeous colors and lighting for some of the interior scenes in the bars as well as scenes set at night along with some naturalistic images for the daytime exterior scenes. Editor Evan Lottman does nice work with the editing as it‘s quite straightforward while featuring some rhythmic cuts for some of the film‘s intense moments such as Francis‘ encounter with a fellow convict. Production designer Albert Brenner does excellent work with the look of the home of Max’s sister as well as the prison he and Francis would go to following one of their antics. Costume designer Jo Ynocencio does terrific work with the costumes as it‘s very low-key and casual to play into the personalities of the two characters. Sound editors Edward Beyer and Robert M. Reitano do superb work with the sound to play into some of the chaotic moments involving the two men at bars and other places they go to. The film’s music by Fred Myrow is wonderful for its mixture of folk and country to play into the humor as the soundtrack includes pieces from Aretha Franklin and Mike Nesmith of the Monkees. The film’s amazing cast includes some notable small performances from Richard Hackman as a prison officer, Rutanya Alda as a woman in a camper that gives Max and Francis a ride, Eileen Brennan as a woman Max gets into a tiff with at a bar, Dorothy Tristan as Max’s sister Coley, Ann Wedgeworth as a friend of Coley who flirts with Max, and Penelope Allen as Francis’ ex-wife whom Francis is trying to reach as she finally appears late in the film. Richard Lynch is terrific as a convict named Riley who would befriend Francis in the middle of the film as well as gain the ire of Max. Finally, there’s the duo of Gene Hackman and Al Pacino in phenomenal performances in their respective roles as Max and Francis. Hackman brings an aggression and quirkiness to his role as Max as someone that is easily antagonized while trying to get things through. Pacino brings a childlike quality to Francis, who also has a nickname in Lion, as well as someone eager to grow up as Pacino brings a lot of humor to his role. 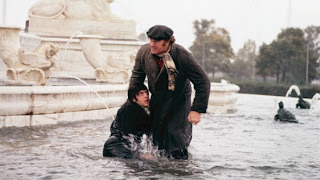 Hackman and Pacino also have this chemistry together that is just fun to watch as they both bring unique personalities into their roles while creating something that is more of a brotherhood than a friendship as they are among the film’s highlights. Scarecrow is a remarkable film from Jerry Schatzberg that features top-notch performances from Gene Hackman and Al Pacino. It’s an odd yet exhilarating road film that manages to be engaging and very funny thanks in part to Garry Michael White’s script and the gorgeous visuals of Vilmos Zsigmond. In the end, Scarecrow is a marvelous film from Jerry Schatzberg. Mahhhhvelous, that's what I like to hear! Thank you. I'm glad you enjoyed that. Gene Hackman & Pacino in an unconventional road movie? Now THAT I gotta see! Haven't even heard of this before, Steven, thanks for the tip! @ruth-It's not easy to find as it was on Turner Classic Movies some months ago in a Friday Night Spotlight on road movies. It is an offbeat yet fun film. I did read that Pacino and Hackman didn't get along on-set because they had very different personalities. @Aaron Cameron Dawson-OK, cool. If there's a Criterion version of the film coming, I'll get it.